Our Portable Loading Chute simply pins together with four drop rods. The two sides are 40” tall and set at an incline for loading and unloading animals. The bottom supporting end frame is 78” tall and the top supporting end frame is 88” tall with 5 settings, 6 inches apart to adjust the ramp to a suitable height. The ramp has cleats 8” spacing for animals to step their way up or down the ramp. The ramp is solid on the bottom and sides and is 18” wide. 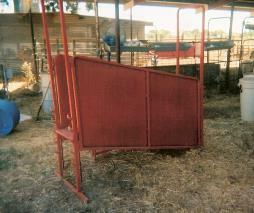 Kustom Loading Chutes are also available.